This quaint lakeside one bedroom cabin is part of Tahoe's North Shore Lakefront Complex Pine Cove Cottages. The large and sandy North Tahoe beach is a stone's throw away, there is a buoy for your boat and a shared homeowners pier.The cabin offers a relaxing living room with a fireplace and a twin bed sleeping alcove for napping or for an extra person and there is a cozy separate bedroom. The kitchen is fully equipped to cook your favorite meal on vacation. Pine Cove Cottage #2 shares the common area, which is a large sunny deck and BBQ, with the other 5 cabins on the property. Perfect spot for a cozy Lake Tahoe getaway. Welcome to Gundy's Getaway, a delightfully cozy 'Classic Tahoe' cabin very near the Lake. Don't be fooled by a glance at the map--the cabin is not right on the highway running around the Lake, rather it is a few cabins up in the delightful Ridgewood Road neighborhood. You will be set back from the hustle of the main road so that you can enjoy time out on the lovely deck. Rustic in feel only, this pine-wrapped home has newly remodeled, beautifully tiled kitchen and bathrooms, flat-screened tv, Wi-Fi, and a large deck with a filtered lake view, barbeque and hot tub. Tahoe mountain decor and a gorgeous old wood burning fireplace round out this authentic Tahoe Cabin. Everyone in the family, including the canine members, will feel a warm welcome. The lake is just a short walk away for a refreshing swim. A lovely community beach is just a mile away. The cabin is centrally located, close to Tahoe City and Kings Beach for wonderful lakefront dining, shopping, music and a great variety of nightlife including the casinos. River Rock Hideaway embodies Tahoe charm with log furniture throughout that brings the mountain feel indoors. 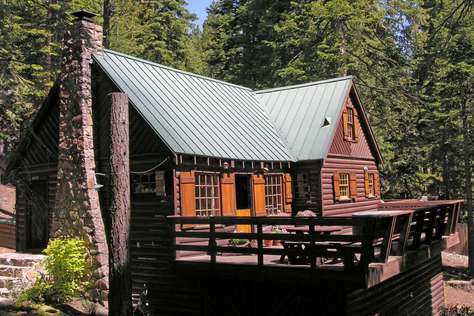 This cozy cabin has a relaxing living room with a wood burning stove for chilly Tahoe nights. A complete entertainment system including TV, DVD, VCR and a stereo system with and CD player is there for your pleasure. The fully equipped kitchen makes cooking a family meal easy and enjoyable. 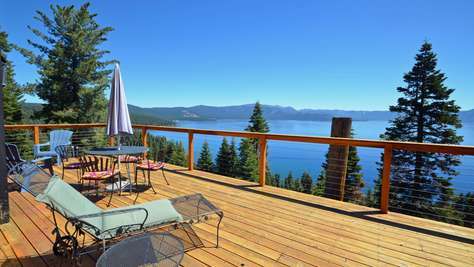 Out back enjoy the sun on the large private deck overlooking the Tahoe National Forest. On warm summer nights the party can stay outside as the meal is cooking on the gas BBQ. A perfect Lake Tahoe hideaway!! Lake Tahoe beaches are a mile away for a refreshing swim, boating, kayaking, or picnicking. Northstar Ski Area is five minutes away for skiing and golf. 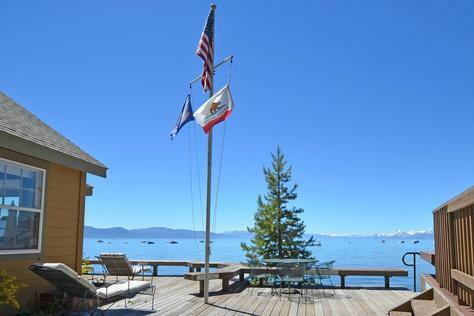 This house is centrally located to Tahoe Vista and Kings Beach. Tahoe National Forest is out the back door for mountain biking, hiking, cross county skiing, and snow shoeing. The North Shore also boasts wonderful lakefront dining and a great variety of nightlife including the casinos. Complementing the stately surrounding of Lake Tahoe is this comfortable vacation home full of personal and luxurious touches. A family room and separate living room with a big screen TV give plenty of space for a large family to spread out and relax. The sunny kitchen, with granite counter tops and upscale appliances, is open to the dining room and living room providing a perfect social setting. The master suite has its own jetted tub and steam shower, very soothing after a day of skiing, riding or hiking, and a cozy gas log fireplace. There is also a second master bedroom with a private bathroom. Snowed Inn is across from the Tahoe National Forest allowing access to snowshoeing, mountain biking, or hiking right out the front door. You and your family will feel very welcome at this mountain home! 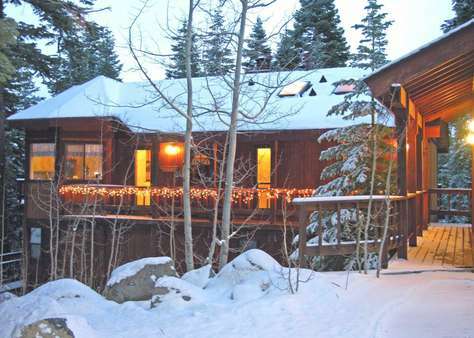 Located central to the North Shore of Lake Tahoe in Kingswood, 5 minutes to Northstar Ski Resort. Alpine Meadows, Squaw Valley and Mount Rose are all about 20 to 25 minutes away. North Lake Tahoe also has a wonderful selection of restaurants, shopping and a variety of nightlife including casinos. 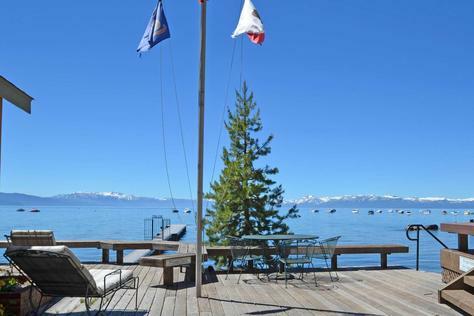 An ideal central location to enjoy all that Lake Tahoe as to offer! You will feel welcome at sunlit and peaceful Woodcrest Cabin any season of the year. 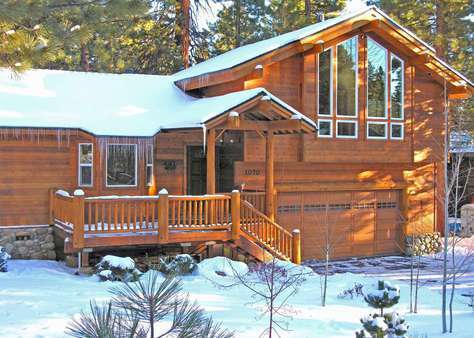 Cradled in stately pines at the end of a quiet street this comfortable Lake Tahoe mountain cabin invites you to curl up with a good book by one of the two wood burning fireplaces or on the sunny and quiet deck. This Tahoe vacation home also boasts a game room with a pool table, a ping pong table and a foos ball table for some family fun. A private outdoor hot tub will ease those sore muscles after a day on the slopes or a summer bike ride. Woodcrest backs up to the Tahoe National Forest giving you the option of snow shoeing, sledding, mountain biking or hiking right out the back door. North Lake Tahoe with numerous beaches for lots of summer fun is less than five minutes by car. Northstar Resort is just over the hill 10 minutes away. Squaw Valley, Alpine Meadows and Mount Rose Ski Areas are all about a 20 to 30 minute drive. North Tahoe offers wonderful restaurants and a variety of shopping. What a perfect family base camp from which to enjoy the playground that is Lake Tahoe! Check-out ﻿time is 10:00am and check-in time is 3:00pm. These times can beflexible depending on when the home is booked again. Please call us if you have a request. 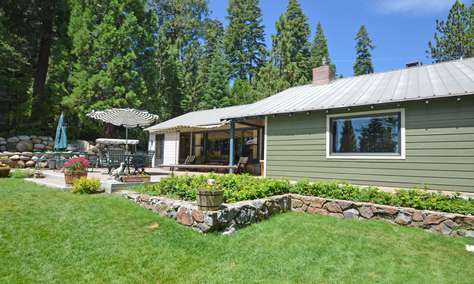 This Tahoe family home is located central to North Shore in Cedar Flat, just outside of Tahoe City, 15 minutes to Squaw Valley and Alpine Meadows and across the street from the Lake. The great room has a cozy wood burning stove and a full wall of windows that overlook Lake Tahoe. The fully equipped kitchen and dining room are open to the great room and also have lovely views of the lake. This home boasts a game room with a foosball table - lots of fun! With an additional family room there is lots of space for your group to spread out. This home also has two master suites for additional privacy. For an extra treat after a day of winter fun one can enjoy the hot tub outside under the stars. Squaw Valley and Alpine Meadows Ski Resorts with a multitude of snow sports are 15 minutes away and Northstar is a 20 minute drive. You don't have to go far for a dip in the lake - just across the street! 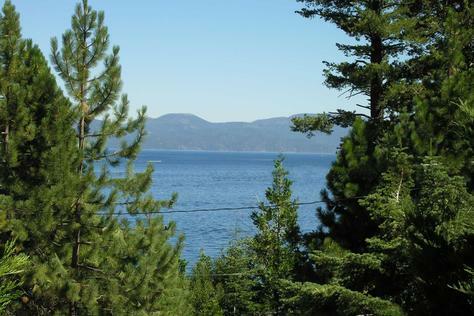 With the proximity to the lake, ski resorts, and Tahoe City you should make "Tahoe Breeze" foremost in your choices for a vacation rental at Lake Tahoe! This family vacation home sits on the Tahoe City Golf Course with a view of Lake Tahoe and the charming town of Tahoe City. In the winter the golf course turns into a community winter park with nordic skiing, snowshoeing and sledding right out your back door. This large 5 bedroom home is all about location, location, location. In the summer enjoy a large maintained back yard and patio for a BBQ and family games of tag and hide-and-go-seek.